A co-convener of the Bring Back Our Girls (BBOG) group, Aisha Yesufu, has urged President Muhammadu Buhari to resign on health grounds. She advised the National Assembly to impeach the president if he fails to step down. “We need to take our country back, let the president resign, if he can’t resign, let the National Assembly do the right thing and let’s have another president. 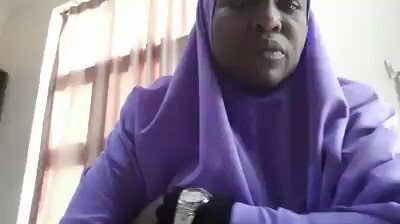 It is not about President Buhari, it’s about Nigeria, and right now Nigeria is suffering and we cannot continue to allow this,” Ms. Yesufu said in a two-minute, 20 seconds video posted on her Twitter account on Friday morning. Mr. Buhari traveled to London last Sunday, almost two months after returning from extended medical leave there. The president first left the country for London on January 19 and returned on March 10. He has not disclosed his ailment. After his return, a member of the House of Representatives, and Mr. Buhari’s ruling All Progressives Congress, Abdulmumini Jibrin, had advised the president to resign, saying his ill health had badly affected governance. Ms. Yesufu said in the video that the idea of Vice President Yemi Osinbajo acting as president is not working and that governance is stagnated in the country. She called on Nigerians to “wake up”, saying the acting president cannot do much because he wants to be seen as a good man. “For crying out loud, the president is sick, the president is not capable of discharging his duties as president, why can’t he resign? Sickness can be on anybody, nobody is wishing the president bad. “The fact that he is sick doesn’t mean he is going to die today or tomorrow. Somebody that is as healthy as I am now can drop dead. It is life! “How long are we going to wait and keep watching everything go in disarray? Who is going to sign the budget, we don’t know. The report on Babachir, what is happening to it? Why are we being held to ransom?” she said. Addressing the president directly, Ms. Yesufu said: “President Muhammadu Buhari, you have gotten the best in this world. A lot of things that you have, most people cannot even dream of. “You have been president twice, you said it yourself, you have reached the peak of your career as a military man and as a politician.